Sometimes, especially in the middle of a summer heat wave, a fan just isn’t enough. Air conditioners aren’t a luxury any more – for many folks, they’re an absolute necessity. But shopping for one isn’t as easy as running by your local appliance center and picking any old model up. Before buying an air conditioner, make sure you’re properly informed on everything from size to BTUs and Seasonal Energy Efficiency Ratio. Sound like a lot? Use this helpful guide to assist you in finding the right air conditioner for your home. Generally speaking, there are three basic types of air conditioning units. Window air conditioners are especially popular and can be easily installed. Just make sure you measure your window dimensions before you head out shopping. Portable air conditioners are even easier to move and store than window units and usually use an exhaust hose to vent out warm air. The major advantage of these units is carrying them from room to room with you, but their portability does sacrifice some of their cooling efficiency. Through the wall air conditioners, are installed right into the wall, permanently, and are ideal for rooms connected to central air systems. They don’t take up window space, provide plenty of cooling power and exhaust outside with the help of vents. When it comes to picking the right air conditioner for the job, you really need to evaluate the room itself. A small unit isn’t going to properly cool a large room. And bigger isn’t always better either. 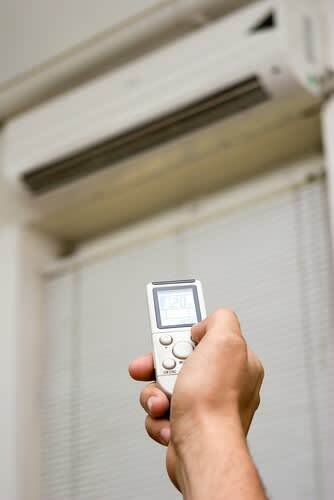 Invest in a giant air conditioner for a small room and you’ll have a new problem: It will cool the air so quickly, it won’t have time to siphon out some of the moisture in the room. The result isn’t cool and comfortable but clammy and wet. To best understand how to size a unit appropriately, you need to note its BTUs. An air conditioner’s BTUs determine how much cold air it can push out. Higher BTUs are better matches for larger rooms. Get an idea of the measurements of the room you intend to cool before you head out shopping, and match the room size to the recommended BTUs on your chosen air conditioner. Modern air conditioners all come with SEERs. This is a rating that tells you just how energy efficient your new air conditioner will be. The higher the SEER, the better. Currently, the minimum SEER allowed by new air conditioners is 13. All Energy Star models, vetted for energy efficiency by the federal Energy Star program, have a SEER of at least 14.5, but many ratings are much higher. If you’re interested in shrinking your carbon footprint, seek out a higher SEER. If you want a high-end air conditioning unit for your home, then don’t skimp on the features. Make sure you have all the essentials that will help you save energy and money while staying cool. Automatic timers and programmable thermostats will allow units to run without your constant supervision. They can also turn off the cool air while you’re at work, saving money, and turn it back on just fifteen minutes before you arrive home. For greater precision and comfort, you might also want a unit that offers digital controls, so instead of choosing a setting such as high, low or medium, you can set the exact temperature you prefer, just like modern furnace thermostats. Some models even come with energy-saving presets, so you can always be green-minded when cooling your home. For many folks, a quiet air conditioner is a huge perk. Older units roar distractingly, but modern ones can be purchased with noise dampening technology that keeps their operations at a low hum. Easy maintenance is also important. You want your new air conditioning unit to last for a long time, and part of ensuring a long life is regularly cleaning your unit. Filters that are easy to locate and clean or replace are a helpful start.